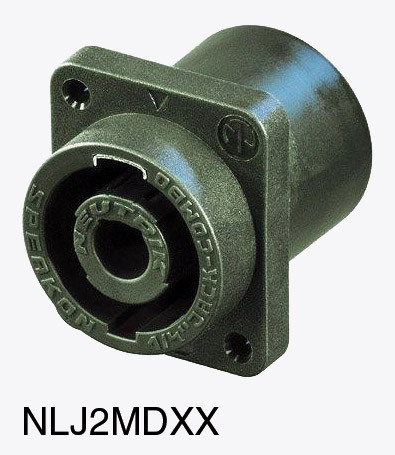 The Neutrik ‘Speakon’ loudspeaker/amplifier connectors are used extensively by amplifier and loudspeaker manufacturers as their standard connector. These special panel-mount connectors combine the ‘Speakon’ connector with a 6.35mm 2-pole jack socket, permitting connection using either type of plug. They are available for PCB mounting, both horizontal and vertical, and have the same PCB footprints as the NL4MD-H and NL4MD-V-1. They mate with all 2-pole and 4-pole Speakon connectors and 6.35mm 2-pole jack plugs. The contacts are designed to operate with high currents and inductive loads, and to prevent any damage from arcing when disconnected under load. All contacts are touch-proof and the connectors meet the safety requirements of IEC60065 ('test finger' procedures). Contacts are rated 30A RMS 250VAC, with high inrush/outrush capability (300A 200mSec).